Leather jewellery has an unmatched charm to itself. Braided and stitched to simple round and flat, leather supplies are available in a variety of finishes and designs. You can use them on their own or mix and match them with a variety of other accessories to create a beautiful piece of leather cord jewellery. 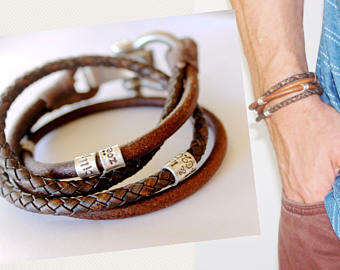 Choose from a range of leather clasp choices to up the ante of your leather bracelets. Read on to know more about them. 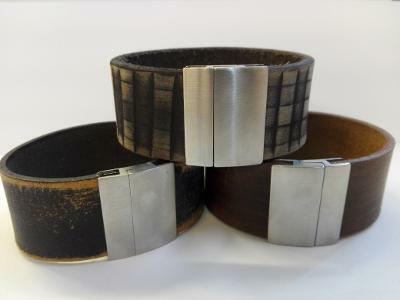 You can broadly divide the clasps into three main types as per the leather type and then there are different styles of clasps suitable for different cord sizes and styles of bracelets. • A curved hook clasp is suitable for a single or multi wrap bracelet that you can create using a 2 mm leather cord and barrel bead. Fold your leather cord in half and slide the barrel beads at the end to create a loop. Glue the ends to the curved hook clasp and you are done. • For a 5 mm leather cord, the round hook clasp is the ideal choice. Pick the choicest knitted or braided cord or go for the metallic sheen leather for a hint of glint and glue the clasp to finish off. A combination of beads and spacers will add more character to your piece. 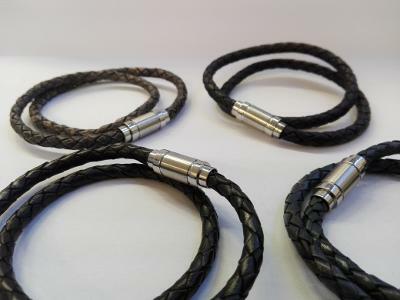 • If you are working with 5 mm round leather to create a single or multi-wrap bracelet then the half-circle magnetic clasp is the ideal choice. Create your own unique pattern by braiding colorful 2 mm cords that will perfectly be secured with this clasp. • Just loop your 5 mm flat leather using a round hook clasp and glue them at the ends. Mix and match with the choicest of accessories such as slider beads or charm for a unique touch. • A 10 mm flat leather project calls for a half-circle magnetic clasp that you can decorate the way you desire. • A magnetic clasp is not only classy, it makes it easy to put on and take off the bracelet as well. • For a mix-and-match project, go for the wide magnetic clasp available in different finishes. Take your pick from flat leather laces and cords, nappa stitched round cords, braided cords, latigo laces and more to create a unique bracelet.